Quinnipiac and Arizona State tied at two on Friday night at Oceanside Arena in Tempe, Arizona. 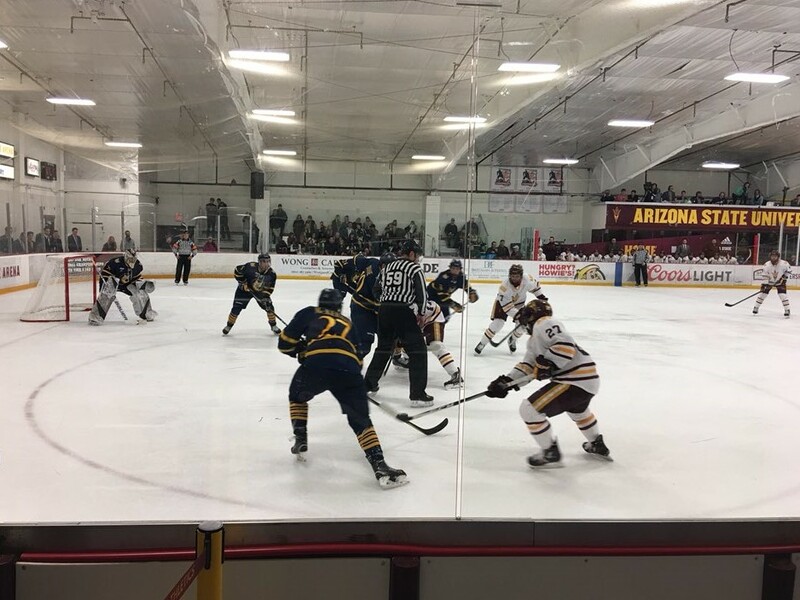 The Bobcats escaped the cold northeast for the valley of the sun for a series with the young, up and coming Sun Devils hockey program. This was Quinnipiac's fourth game with Arizona State in the last three years but the first one out west. A week after a strong showing by Keith Petruzzelli in a 2-2 tie against Harvard, the freshman got the nod in goal again. It was the first time all season that Petruzzelli (24 saves) has gotten back to back starts for Quinnipiac. The teams played to a scoreless first period. In the second period with Quinnipiac on the penalty kill for a too many men on the ice penalty, Kevin Duane beat a defender shorthanded and used his big frame to to bring the puck into the zone and scored high glove side past the Sun Devils Joey Daccord (28 saves) for his first goal of the season. It was the first shorthanded goal for Quinnipiac of the season who had only one shorthanded goal a season ago. The Sun Devils evened the score at one on the power play at the 8:05 mark of the second when Johnny Walker (8th goal of the season) entered the zone easily and fooled Petruzzelli with some solid skill work. Late in the period it was a Pasichnuk to Pasichnuk crime on the Bobcats as Brinson fed brother Steenn for the 2-1 lead. Quinnipiac tied the score on the power play a little over seven minutes into the final period when Alex Whelan took a backdoor pass before waiting for Daccord to get out of position and firing one past him for the goal. 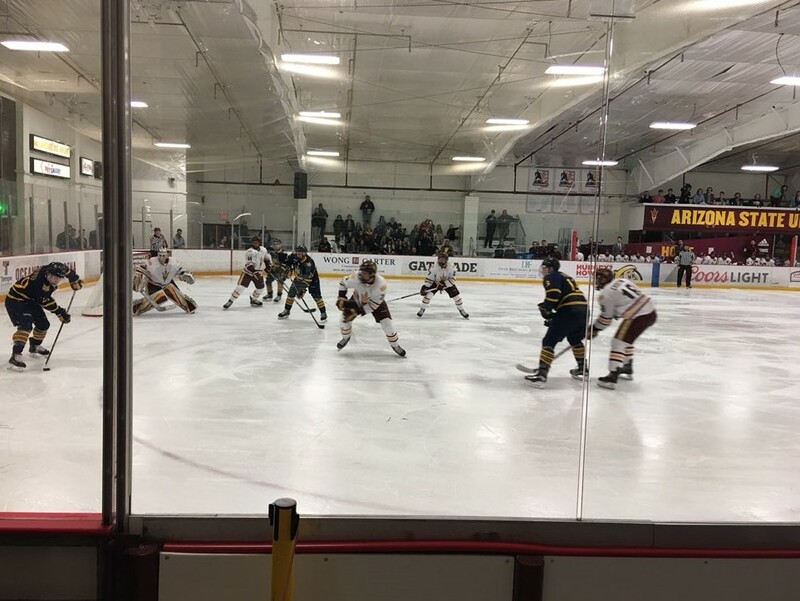 With less than six and half minutes to play it looked like Quinnipiac took the lead when Craig Martin put home a rebound off a Luke Shiplo chance but the play was waived off due to goaltender interference. The teams headed to overtime where neither team scored. The game officially ended in a 2-2 tie but played on in a 3 on 3 second overtime where Arizona States Louie Rowe scored in the gimmick overtime to give Arizona State the unofficial 3-2 win. With the tie Quinnipiac is now 8-12-4 on the season. They will wrap up their non conference schedule on Saturday night when they take on Arizona State at Gila River Arena in Glendale, Arizona which is home to the Arizona Coyotes.